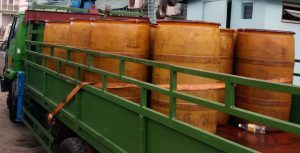 Some of the drums of fuel seized by the Guyana Energy Agency. The Guyana Energy Agency (GEA) says 1,900 gallons of fuel were seized in the Mahaica area on Monday, but several persons who were transporting the fuel in boats made good their escape. “Field tests carried out by GEA’s Inspectors revealed that the fuel was illegal as the marker concentration was below the legal level. As a result, all 38 drums of fuel were seized along with both vessels, an outboard engine and a gasoline powered pump. Investigation into the incident is ongoing,” the agency said. The GEA said on Monday , April 10, 2017 its inspectors, with support from the Guyana Police Force (GPF) and the Guyana Revenue Authority (GRA) conducted an operation in the Mahaica area. “During the course of the operation, Officers observed two boats, linked together, containing several drums in the area of Helena Number One. The occupants of the vessels refused to comply with instructions issued by the officers for them to come ashore and initially started to sail away. However, shortly after, they abandoned the vessels by jumping into the river and making good their escape. Efforts to pursue them proved futile,” the GEA said in a statement. The smaller of the two Boats Seized by the Guyana Energy Agency (GEA). The agency said a public spirited citizen assisted by swimming and pulling the boats ashore. “Upon retrieving the vessels, it was discovered that there were efforts by the occupants to sink the larger of the two vessels. Thirty eight drums containing fuel were also discovered which is estimated to be 1,900 gallons,” said GEA. The GEA lauded the efforts of its Inspectors and Field Operation Coordinator for their diligence and commitment in managing the operation. Thanks is also extended to the GRA and GPF for their support and partnership which aided in making the operation a success. The Guyana Energy Agency says it continues to monitor fuel related activities to ensure compliance with the GEA Act and Regulations. GEA reminded the general public that ‘Fuel Smuggling’ affects everyone. Anyone with information on fuel smuggling activities can report same to the Guyana Energy Agency at 226-0394 exts. 204 or 239 or 629-3391.